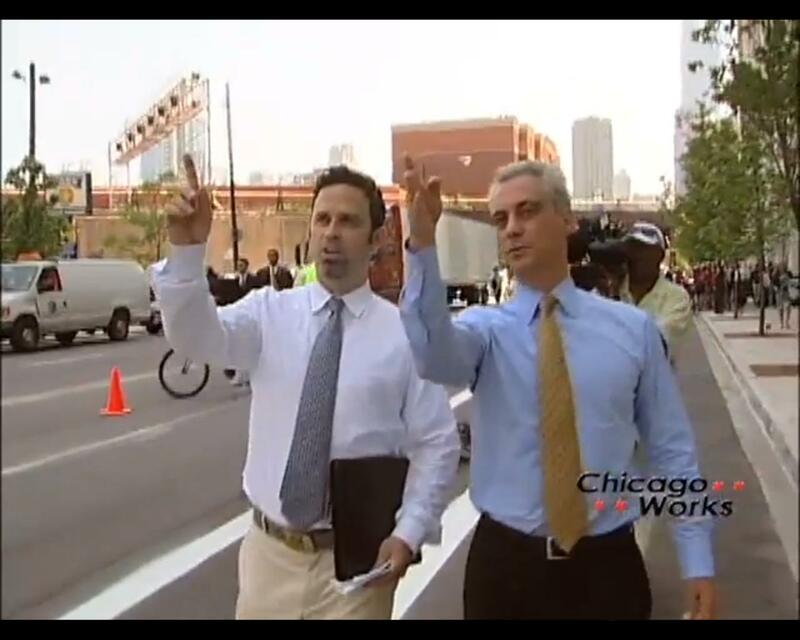 Rahm Emanuel and Gabe Klein are bringing 100 miles of protected bike lanes to Chicago. Along with a new mayor, Chicago got its first protected bike lanes this past month. Funded by a federal grant, the Chicago Department of Transportation is installing the half-mile bike lane as a pilot program. The protected bike lanes will have a three feet buffer to parked cars and will be separated by delineated posts. The addition of bicycle infrastructure to the city’s landscape is no surprise, Mayor Rahm Emanuel promised during his campaign for office to install 100 miles of protected bicycle lanes by the end of his term. The city’s new Transportation Commissioner, Gabe Klein, is also on board with adding bike lanes to the city’s streets. In addition to increasing bicyclists in Chicago, Klein’s foremost goal is to slow down traffic in the city. Previous to his Chicago position, Klein served as the director of The District Department of Transportation in Washington, DC, where during his tenure, the city launched a bike-share program and expanded bike lanes. We’re looking forward to watching and supporting Chicago’s efforts in increasing sustainable transportation options. Watch the video below to learn more about Chicago’s bike lane expansions.